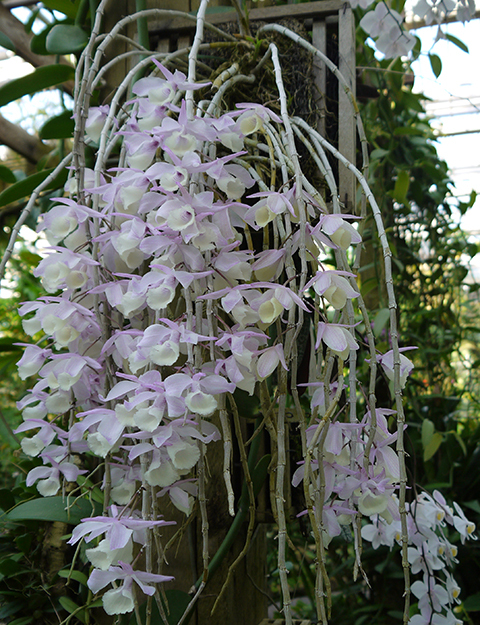 Dendrobium aphyllum in late April and early May in the Orchid Display House. Dendrobium aphyllum is amazing. The medium-sized plant pictured above produced more than one hundred flowers this spring. Almost every node on the gracefully arching pseudobulbs produced a pair of lavender flowers, each with a densely fuzzy white lip. For me, it's the plush velvet lip, not simply the floral production, that makes this orchid irresistible. Dendrobium aphyllum grows in India, Myanmar, Thailand and south China at 200 to 1800 m in seasonally dry tropical forests. The plant produces new leafy shoots in the spring that eventually become long slender pseudobulbs. The pseudobulbs shed their leaves after about a year. (Aphyllum means leafless.) Buds form in winter on the mature pseudobulbs. In cultivation D. aphyllum (and similar species like D. anosmum) will thrive on a slab of tree fern, cedar or cork, or in a hanging basket to accommodate the pendant pseudobulbs. Our plant is mounted on a slatted cedar slab. A small slatted basket creates a healthy environment for roots, but can become quirkily lopsided if the plant insists on directing all of its new growth to one side. Our plant gets the spa treatment in summer in a warm moist greenhouse. In November we move it to a cooler (53º nights) brighter greenhouse and back off the watering somewhat until January when the buds are visible. Aside from a thorough watering every ten days or so, it needs no maintenance at all during its winter rest. A terrific plant!